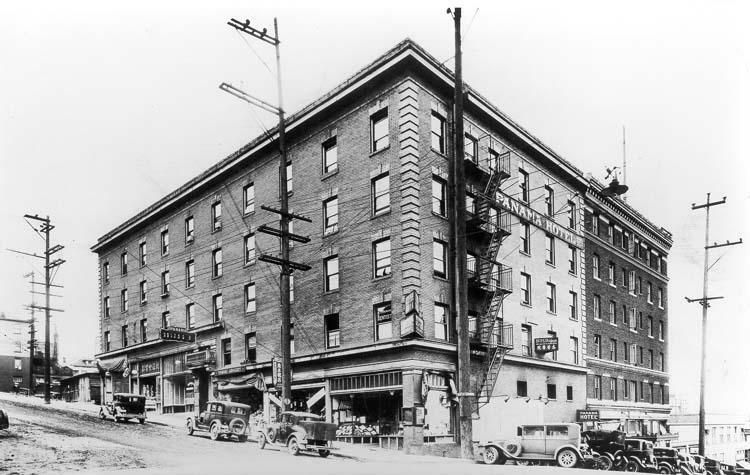 This early picture of the hotel was photographed in 1929. The building still maintains much of the original sturcture. 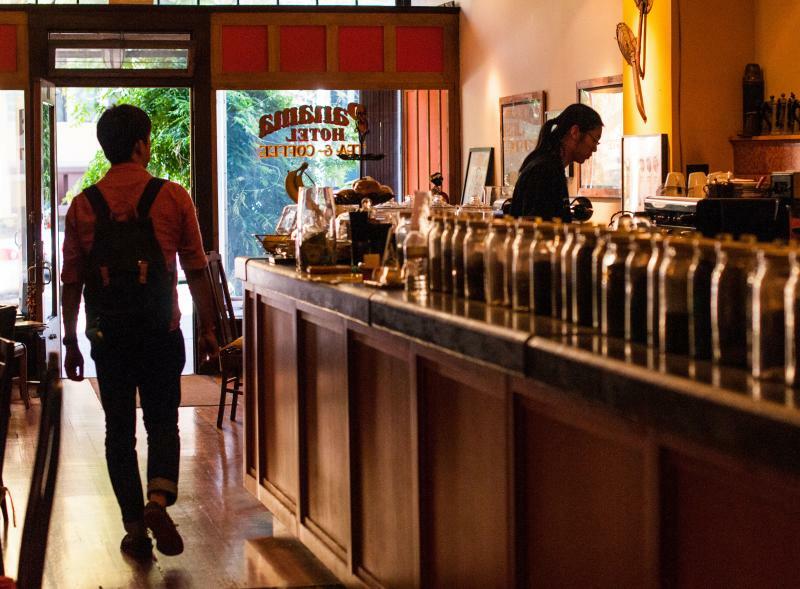 Interior of the Panama Hotel's tea house. The muse behind Steve Grigg’s musical project is a brick, six-story, century-old building that stands in what used to be Seattle’s Japantown. The Panama Hotel, on the corner of Sixth and Main, remains a working hotel. But the historic building is also a time capsule. It features belongings left behind by Japanese Americans who were forced into internment camps during World War II. 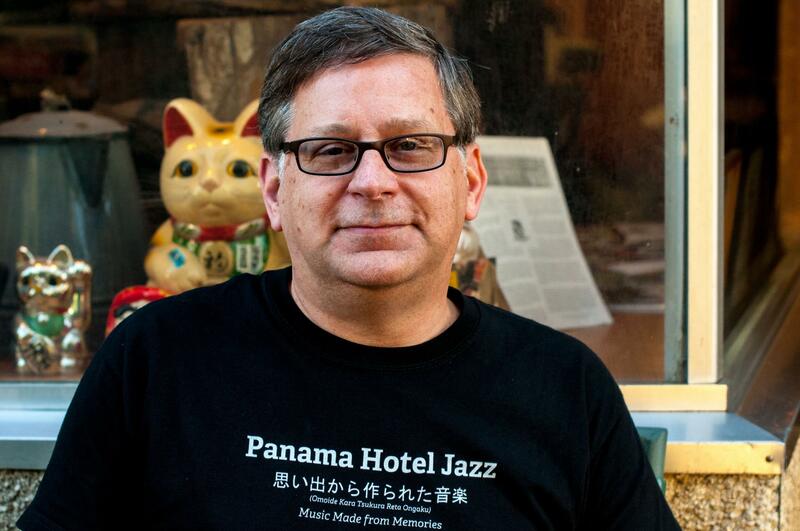 Griggs’ project, called “Panama Hotel Jazz,” weaves in music with narration to tell the story about the incarceration of Japanese and Japanese Americans in 1942. 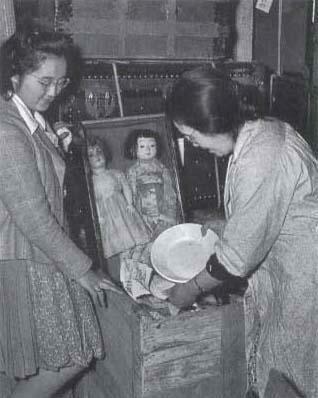 Two Japanese-American women storing valuables in the basement of the hotel. Griggs, a transplant from New York who’s been living in Seattle since 1993, initially learned about the Panama Hotel from a 2009 novel, Jamie Ford’s “Hotel on the Corner of Bitter and Sweet.” The narrative focuses on a love story between a Chinese-American boy and a Japanese-American girl during the internment, and is set in Seattle. Griggs’ music, recorded with an ensemble of four other musicians, spans the broader story of the once-thriving neighborhood that used to be known as Nihonmachi (Japantown). It pays homage to the hotel, now a National Historic Landmark, as well as to Densho, a Seattle-based nonprofit organization that’s collecting oral histories of internees. In one song titled "Kimi Ga Yo", Griggs offers a new take on the Japanese National Anthem. And in one story, he talks about the reparations made decades later to those who were interned. But the emotional core of the project is the stories and songs about abandoning one’s homes and possessions and enduring the camps, which were often located in desolate areas. “After long bus and train rides, they (the Japanese Americans) would show up and see these places (the camps), often with barbed wire and hastily-constructed barracks. I wanted to evoke this melancholy, lonely atmosphere,” Griggs said. The result is the song "Desert." Jazz musician and composer Steve Griggs. Grigg's ethnicity is not Japanese and he has no direct connection to this chapter in Seattle’s history. So he wanted to make sure he researched as thoroughly as possible in order to pay homage to those who endured the camps. “Many of the memoirs tell the facts but they have this restraint. Mary goes deep into what she was feeling,” he says. In one scene, Grunewald describes how she lined up her dolls to say goodbye to them before burning them on the eve of reporting to the camps. When he performs his “Panama Hotel Jazz” music, Griggs reads from Grunewald’s memoir. The Panama Hotel was declared a National Historic Landmark in 2006. The designation stands in the entry way of the hotel's tea house. As part of his creative process, Griggs studied Japanese poetry, visited the Japanese Garden at the Arboretum and, of course, hung out at the Panama Hotel. And he also embraced the fictional narrative of Ford’s novel, which references Seattle’s vibrant jazz scene. 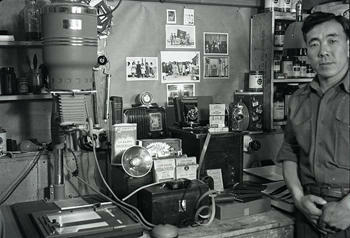 The book includes a real-life character, the jazz musician Oscar Holden, who ends up recording a fictional song. And a record of the song, in Ford’s story, ends up in the basement of the Panama Hotel. In real life, there are no actual recordings to be found of Holden’s music. But as part of this project, Griggs interviewed Holden’s children and grandchildren and researched the kind of music Holden played when he was alive. The end result is "Alley Cat Strut," the name of the song as imagined in the novel. The Steve Griggs Ensemble is performing free “Panama Hotel Jazz” concerts at Seattle libraries through the month of September. 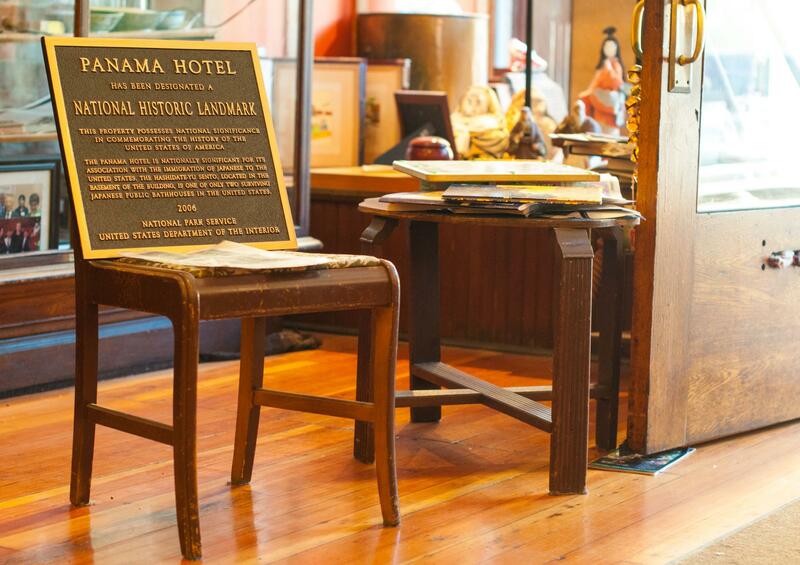 Beginning in October, the concerts will move to the Panama Hotel tea house. The largest private collection of photographs taken during World War II at an internment camp for Japanese-Americans is being donated to Washington State University. 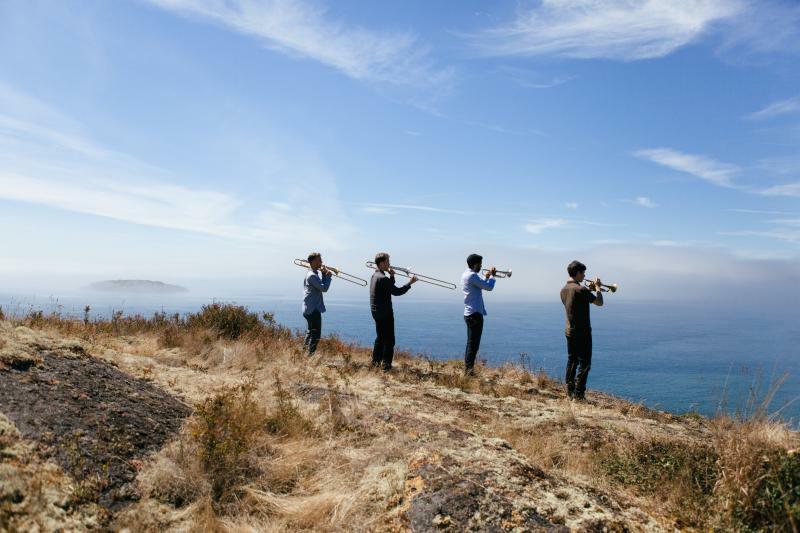 The Westerlies are a new young brass ensemble based out of New York City. They’re an all-over-the-musical-map group whose first album is already garnering critical praise. And this first bit of success could have something to do with their Seattle roots. All four musicians, all in their 20s, grew up in Seattle where they absorbed much of the local music scene. They’re the product of two of the best high school jazz programs in the country: Garfield and Roosevelt high schools. And their debut album, recorded in a family friend’s cabin on Lopez Island, is a reinterpretation of an eclectic mix of compositions by Seattlelite Wayne Horvitz.